Trains that brought the hunters hauled out the bones. The survival of the early homesteaders of the prairie depended on fully unitizing the resources that were easily available; Sod substituted for wood in the earliest dwellings, potatoes planted under furrows to break up the turned sod, providing hardy meals or the gathering of bones of the bison; the final remains of the rotting carcasses left by the contract hunters, who decimated the great herds, while only being interested in the best meat and hides. 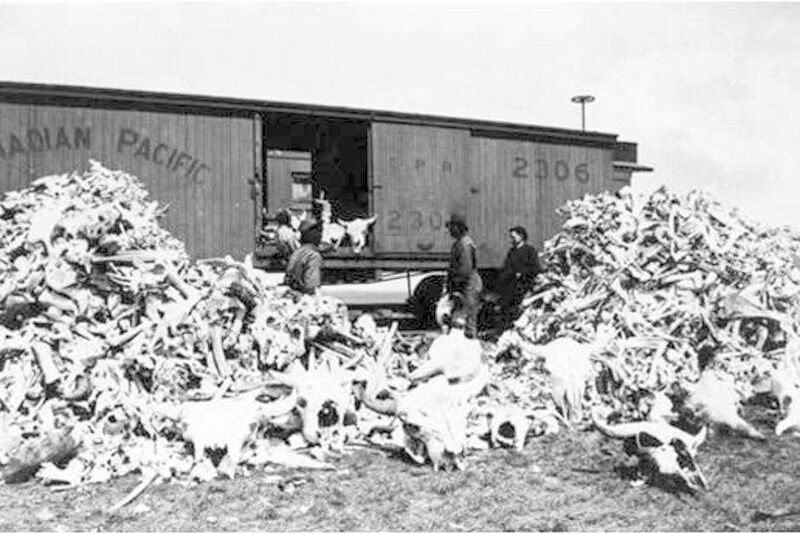 The 1880’s brought many settlers to the prairie who found their future farms covered with these buffalo bones. At first these bones were seen as a nuisance, another chore in the task of clearing the fields. But, it didn’t take long for the struggling Minnesota sugar beet industry to take advantage of the bone bonanza. Cleaned and dried, buffalo bones were ground up for fertilizer or transformed into charcoal, which was used to clarify the sugar, giving us the white sugar we are all use to putting on our cornflakes. Cash starved homesteaders could have the entire family out on the prairie gathering the bones and stockpiling them. The settles hauled the bones to the railroad which bought the bones for about $10.00 a ton, enough money to keep the family going in those early years. This entry was posted in Blog, Family Memories, Poetry and tagged Bison, Buffalo, History, Homesteading, North Dakota, Poetry. Bookmark the permalink.